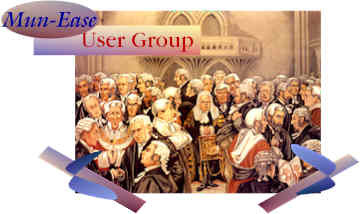 Our user group meetings are usually held in the spring of every year. Last year's meeting was held on Tuesday, June 18 in Denver. During our user group meetings, we demonstrate upcoming enhancements and answer questions from our users. The meetings also provide an opportunity for our users to voice their opinions about enhancements that are important to them. For many years now, Howard Stevens of the Bureau of Public Debt has been one of our featured speakers at our user group meeting. During the 2002 User Group meeting we had an excellent discussion that centered around the format of the daily SLGS rate table that is maintained by the Bureau of Public Debt. Previously SLGS rate information was not in a format that could be loaded directly into Mun-Ease. Instead you had to perform a few intermediate steps: (A) Start Excel and import the SLGS table into Excel through the Data | New Web Query menu option. (B) Save the spreadsheet as a comma-delimited file. (C) Start Mun-Ease and import the SLGS rates from the comma-delimited file through the Settings | SLGS | Import menu option. Also while in Excel, you must disable the automatic date recognition feature since Excel will incorrectly convert the SLGS table if that capability is not disabled. Recently Howard telephoned to inform us that the Bureau is undertaking a software project to convert the daily SLGS rates to a format that is more readily accessible by third-party programs like Mun-Ease. We suggested that the data be converted to comma-delimited file and provided the Bureau with a sample template of how data should be formatted. We also helped the Bureau of Public Debt test the interface. The 11.0 version of Mun-Ease supports this important new feature!